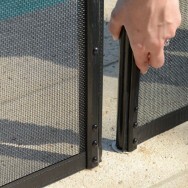 Learn why choosing our safe and stylish pool fence will help to protect your children or grandchildren. Your Protect-A-Child removable mesh pool fence will provide your family with a secure, stylish and long-lasting pool safety solution. 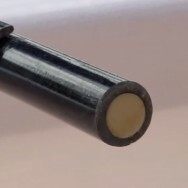 Our fiberglass posts include a lifetime warranty against breaking or ever becoming bent, so you can be sure your pool fence stays straight, strong, and attractive for life. 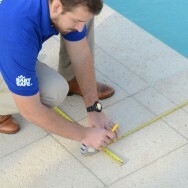 Your pool fence can be easily removed by an adult, while it’s safety features prevent children from taking out the posts. 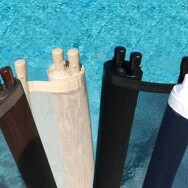 Unbreakable strength from our solid fiberglass core is only one of the many benefits of our unique pool fence posts. You get extra layers of protection from our patented Lock-in-Deck Posts, Point-Lock Secure Latches, and Self-Closing Gates. Choose from multiple pool fence color and height options to create the perfect design for your family’s needs. Your fence comes with strong, durable mesh made with weatherproof stitching and border. Proven in over 30 years of field use. 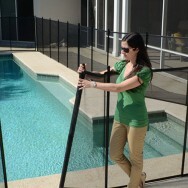 We treat your pool fence installation as if it is our home and our family. Your new fence will be safe and look great.